With the festive season fast approaching, it’s a popular time of year for parents across the country to be booking themselves in for Christmas family photoshoots. After all, family photos make great Christmas gifts; either as prints or mounted in a frame. Or as a piece of artwork destined to be hung on the walls. But, here at Bundles of Joy Photography, I choose NOT to offer Christmas family photoshoots. Curious to know why? Read on! Why Christmas family photoshoots aren’t for me! Now, don’t get me wrong, I can appreciate why you might consider a Christmas family photoshoot. Just like you, I enjoy looking at family portraits. And, I also enjoy taking family photos. I really do! But, for me, on a professional basis anyway, Christmas family photoshoots are definitely a no-no! I see lots of photographers at this time of year offering a quick, cheap photo session and a handful of digital images on a USB stick for less than £100. A ‘stack them high, let them fly’, bums-on-seats type approach. That type of service just isn’t the kind of work I enjoy doing. Instead, here at Bundles of Joy Photography, we do things a little differently! You see, I learnt very quickly after setting up my photography business that there is no benefit to trying to be a ‘jack of all trades’. I’ve found success in sticking to the formula of offering a high quality, premium newborn photography experience which offers my ideal clients exactly what they are looking for. As such, any family pictures that I capture for clients are part of my signature newborn photography service. I don’t offer separate family photoshoots because the focus in my work is on the baby. The ‘family’ portraits I take are done to complete the portfolio of images I take in a typical newborn session, and usually only involve the parents or the sibling(s) of the baby or both. I aim to capture the close bond between a parent and their newborn baby; a mother and newborn son, father and newborn daughter. Whatever the combination, these are intimate and special family photos. Some of the examples I include here (and see more in my gallery) are among my favourites. What also makes us different is that we offer timeless newborn portraits which are pieces of art in their own right. Unlike novelty portraits taken during a typical Christmas family photoshoot. Our images remain relevant and beautiful to look at as the months and years go by. And yes, while they’re more expensive, our happy clients agree with us that they’re worth the investment because of the years and years of enjoyment that can be had from them. And, if you invest wisely in quality printed products, they’ll be durable too! Professionally printed portraits – such as the ones I source from my suppliers – retain their vibrancy and colour for years and years. Far longer than a photo printed at your nearest supermarket would. Finally, I specialise in newborn photography because I love what I do and am extremely passionate about it. Not because it’s the latest craze or way to make a quick buck! In fact, I have been a specialist in newborn photography now for four years and have worked with hundreds, if not thousands, of newborn babies! My assistant (and mum) Sue and I welcome our clients into our cosy home-based studio here in Froggatt in the Peak District, and we believe that we offer something really quite special. I offer limited sessions each month and am dedicated to offering an exceptional experience to my clients. Come and try it out for yourself! We’re now taking bookings for Spring/Summer 2018 babies. Please get in touch as soon as possible to book your preferred session date and time. You can book your newborn photoshoot with me by calling 07973 939 522, emailing me at photos@bundlesofjoyphotography.co.uk or by completing this contact form. Thanks for reading and I look forward to meeting you! Why choose Bundles of Joy Photography? 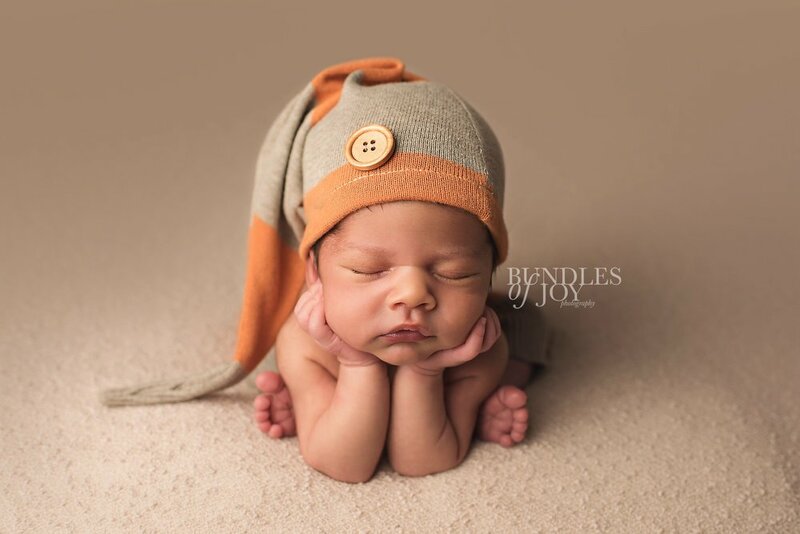 Do all babies sleep through their newborn photoshoot? Exciting international photography award news for Bundles of Joy Photography team! When it comes to choosing a newborn photographer, we realise that you are likely to be spoilt for choice. But rather than tell you why we believe we are different and why you should choose Bundles of Joy Photography, in today’s blog I thought it would be better to let our client’s do the talking! We have received many glowing testimonials from our clients over the years. So, below is a small selection of just some of those. The ones shared here have been posted on our Facebook page. Do take a look there if you fancy reading more or visit our testimonials page on our website. Of course, we are thrilled when client’s express their delight with their photos and their experience. But, the purpose of sharing these reviews here is to help you discover what makes the newborn photography experience we offer so special. · and, most importantly, our beautiful newborn portraits. Why choose Bundles of Joy Photography for your newborn portraits? “We had the best experience with Georgina and Sue. I went from being really worried about leaving Grayson to being totally relaxed within minutes of meeting them both. We were able to watch and hear the photos being taken. Having the time to just sit and relax with my husband was amazing while being looked after with yummy coffees and treats. Their knowledge and experience of babies taught us so much we actually bought some of the tools they used while we were there. The shusher for one. If you are considering booking a newborn photoshoot and have any questions whatsoever about a typical session with Bundles of Joy Photography, please take a look around our website for more information. Alternatively, please don’t hesitate to call me on 07973 939 522, email me at photos@bundlesofjoyphotography.co.uk or complete this contact form. The safe arrival of your new ‘bundle of joy’ is a time for celebration! After all, this is a life-changing event. You have become a parent and welcomed a new little person into the world! But how can you celebrate this super-exciting time in a way that isn’t exhausting for an already-tired mum and dad with a brand-new baby? Well, here are my recommendations! Yes, everyone including grandma Joan, Auntie Carol, cousin Sarah and even the neighbours will be desperate to meet the new member of the family. But remember that in the immediate aftermath of the birth, you shouldn’t feel guilty about having some uninterrupted bonding time with your new baby. Get as much skin-to-skin time as you can in those early hours and days. Spend some quality time with you and your baby. It will be time well spent. Celebrate the birth of your baby with cuddles, kisses and snuggles. Take it all in! Their smell, the softness of their skin, stroke their hair, and let them clasp their hand around your finger. Enjoy all those deliciously special moments that you experience as a new parent and savour them. Then, when you’re ready (and only when you’re ready), announce the exciting news and let your friends and family in on the celebrations! Typically, a baby shower is an event held before the arrival of the baby. But there is no reason why you can’t have a small informal gathering after baby arrives. Perhaps even get a ‘birth-day’ cake made, personalised with their name and birth date? Here’s how an event like this could work. You invite a small crowd of friends and family, and together toast the birth of your baby. Just have refreshments on hand – perhaps Prosecco for a celebratory toast? This kind of one-off event is a great idea because you can control the visiting hours – make it clear that invited guests are all welcome, but only within set hours (perhaps even limit the entire event to one hour in total). Then, when that hour is up, everyone leaves! Guests will likely have gifts to pass on and will love the chance to take a peek and perhaps have a quick cuddle with your new baby. But the bonus for you is that if they attend the group event, they will be less likely to visit individually over the coming days. Leaving you and your new baby in peace, so you can relax and get to know each other without regular interruptions from individual visitors. This is a lovely way to celebrate the birth of your baby. The seedling or small tree can be planted in your garden at home, perhaps alongside a plaque with your baby’s name and birth date. And you’ll have the joy of watching it grow over the years, as your baby will! Hiring a professional newborn baby photographer, like me, and having photographs taken of your baby in their very first days of life is another great way to celebrate the birth of your baby. Newborn portraits are typically done when the baby is approximately two weeks old or younger. That way, I can create you a series of portraits which are a permanent record of the adorable newborn stage – when your baby is curled up as they were in the womb, sleeping and peaceful. Babies change so quickly and in a matter of weeks, your baby will have altered dramatically! I tell my clients, you only have one chance to capture beautiful newborn portraits. Don’t miss out! And I would urge anyone planning to have a newborn photoshoot to book it well in advance, otherwise, you risk there not being a slot available on the dates you need. 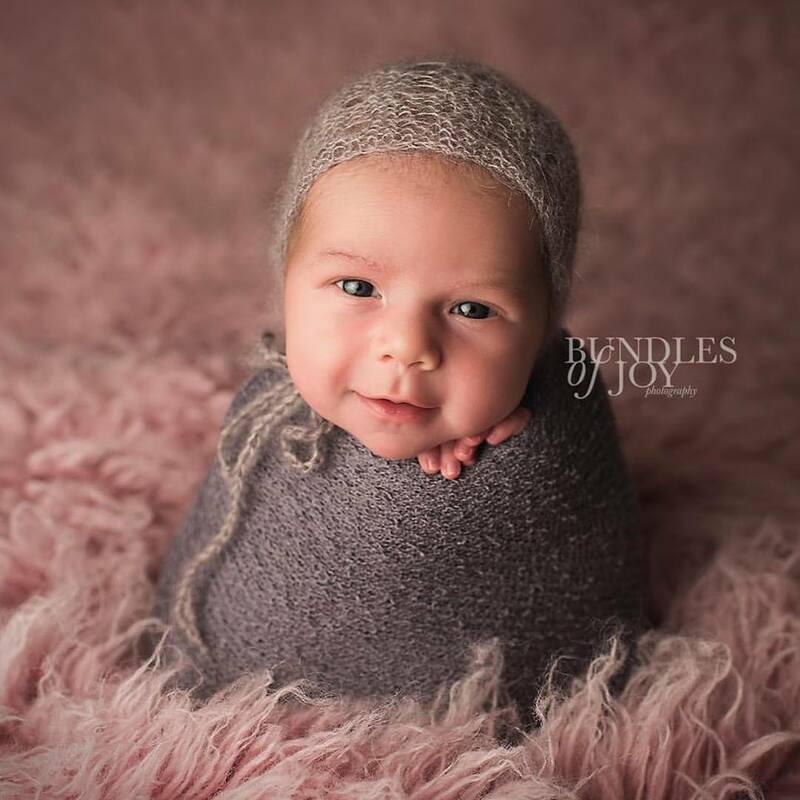 Professional baby portraits by Bundles of Joy Photography are a great way to celebrate the birth of your new baby, and are an investment that my clients tell me they have never regretted! The photographs will be something you look back on in years to come. As well as newborn photography, there are other lovely ways to capture the newborn phase and to celebrate the birth of your baby. Have you heard of keepsake jewellery? Keepsake jewellery are beautiful items of jewellery that are unique and personal to you, with great sentimental value. They can feature your baby’s name and perhaps even their birth date and weight, or their birthstone, or even their footprint? Similarly, you could get your baby’s hands and feet cast. The casts can be turned into charms for a bracelet or necklace, or they can be mounted and framed. As with professional newborn photographs, the cast becomes a permanent momento of your baby as a newborn. This is a lovely way of celebrating your baby’s arrival – something you could buy yourself or for your partner. Or if you’re a family member or friend of the new mum, either buy them a casting session with a local maker or contribute vouchers towards to the total cost of the finished product – they’ll love you for it! If you are already a parent, how did you celebrate the birth of your baby? Do please let me know in the comments below. And if you’d like to enquire or book a newborn photoshoot with me, please contact me as soon as possible on 07973 939 522, email me at photos@bundlesofjoyphotography.co.uk or complete this contact form to secure your slot. The newborn stage is typically when babies sleep for more of the day than they are awake. In the first two weeks or so after birth, babies can even sleep for up to 18 hours per day. Amazing, isn’t it! So, you’d think that all the babies that come to me as just-born babies for their newborn photoshoots would be sleeping all through their sessions, right? Not all babies sleep during their newborn photoshoot! So, occasionally I have the pleasure of seeing the gorgeous little bundles of joy who visit me wide awake and doey eyed, taking a good look around them. Here, I’ve rounded up just some of the adorable baby portraits I’ve taken for my clients recently that show the baby wide awake. Take this as proof that not all babies sleep through their newborn photoshoot and that that isn’t necessarily a bad thing. These curious little guys and girls obviously just want to know what’s going on, and it’s wonderful when that happens! It absolutely melts my heart to see their beautiful, bright eyes. Look at baby Laurie’s intense stare in this one. She was wide awake for a good part of her session because she was nearly 5 weeks old and past the sleepy newborn stage. How gorgeous is this?! Little Albert decided he was going to have some wide awake time during his session and it was so worth it! I just LOVE this shot of him. This one of beautiful baby Millie has to be one of my all-time favourite shots! Look at those wide open eyes and smile. She was looking directly at me as I photographed her. Absolutely gorgeous! I really do love a wide awake shot. This is little Mika. How beautiful is she? Smiling babies are the cutest! Sometimes I even get a lovely smile to photograph! This little lady, Poppy was very obliging. As she was five weeks old, her mummy had told me that she was usually wide awake for most of the day. But during her photoshoot, she slept like a little star and we managed to do all the sleeping baby poses successfully. Then she gave us loads of awesome smiles as well! What a gorgeous little girl. And I just love her eyelashes! Did your little one sleep through their newborn photoshoot? Perhaps they even cracked a smile? Do let me know in the comments! The baby boom continues here at Bundles of Joy Photography. I have been so blessed to have had a really busy summer and to have been visited by so many gorgeous new babies and their lovely mummies and daddies. If you are expecting a baby in 2018 and would like to book in for a newborn photoshoot of your own, please contact me as soon as possible to secure your date. Please contact me on 07973 939 522, email me at photos@bundlesofjouphotography.co.uk or complete this contact form. I have a limited number of slots available for Autumn and Winter 2017 now – please enquire ASAP if you’re looking for something in the next few months. 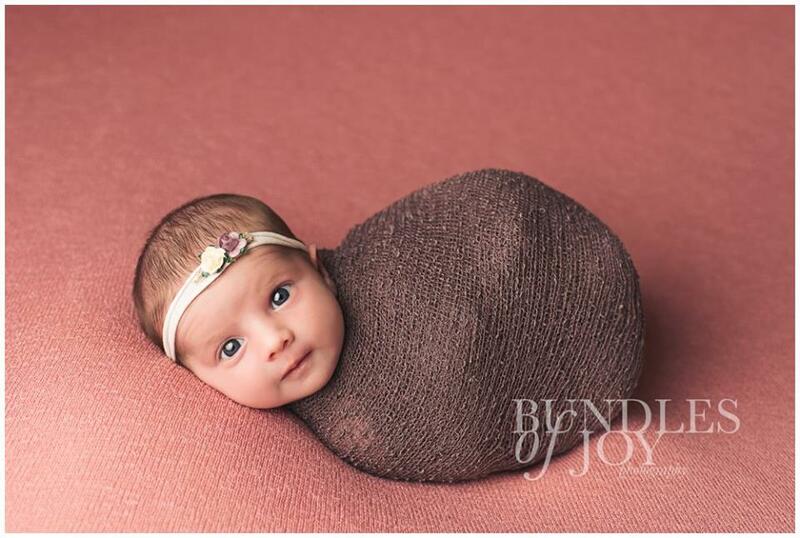 Newborn Photography: Babies dressed to impress! In your search to find a newborn photographer, you will have perhaps noticed something about newborn photography. And that is that newborn babies are usually photographed naked in a professional newborn photoshoot. That’s so that the gorgeous soft, wrinkly skin of the baby and their small bodies, all curled up as they were in the womb, are on full show in the pictures. 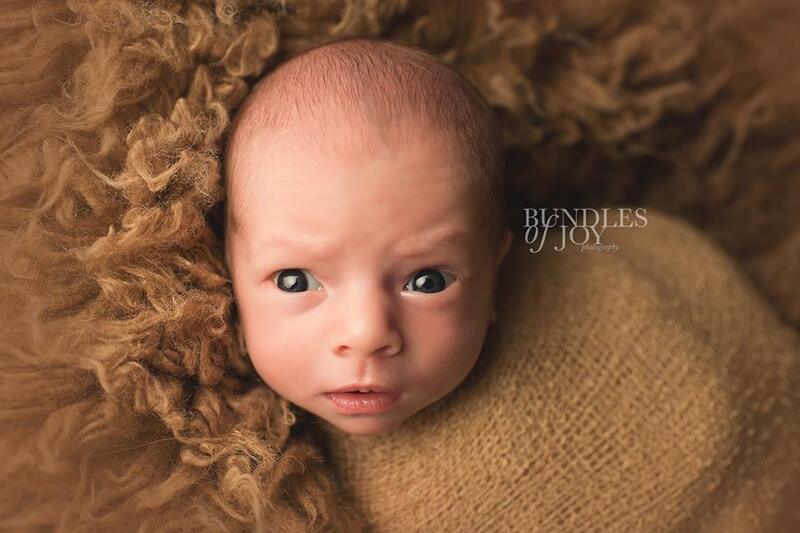 But if you’re not a fan of the ‘naked baby’ photos, don’t be put off newborn photography altogether. There are options! For example, not all the newborn portraits I take have the baby undressed. Far from it! In fact, personally, I love dressing my ‘bundles of joy’ clients up into little outfits! And in this blog, I’m including lots of examples of my newborn photography work – all of which feature babies wearing newborn outfits. 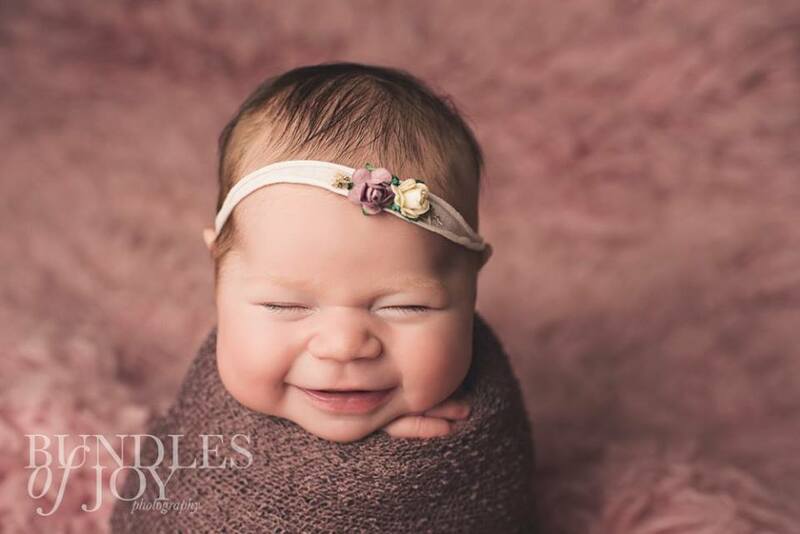 The teeny tiny little clothes or accessories cover the baby’s modesty while still being beautiful newborn portraits that their parents have absolutely adored. If I’m honest, I’ve got a huge selection of newborn-sized clothes. So, when you come to me, you’ll be spoilt for choice! Miniature vintage rompers, cashmere all-in-ones and delicate lacy vests to name just a few. And that’s without all the gorgeous little accessories like hats, headbands and blankets that I have either bought or made over the years! Yes, newborn photography is traditionally done with the baby undressed. While the baby’s modesty is always maintained, most photographers do take the majority of their baby portraits with the baby naked. But if you’re not a fan of the naked baby photos but do still want adorable newborn portraits of your own little bundle of joy, when he or she arrives, I can create images like these for you too. If you’d like to look at more examples of my newborn portraits, please pop over to my gallery where you can find more of my work. And if you’ve yet to book your newborn photoshoot, please contact me as soon as possible on 07973 939 522, email me at photos@bundlesofjoyphotography.co.uk or complete this contact form to secure your slot.